Here's a wonderful gift idea for a high school or collegiate swimmer. The male swimmer personalized Christmas ornament can be used as an award and personalized as shown or offered as encouragement to those seeking to reach their peak potential. 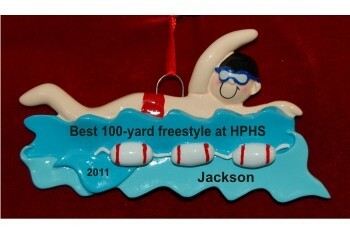 What makes these swimmer ornaments personalized from Russell Rhodes very special is the customization. A lettering artists will add the details where shown, but they'll be hand painted in a handsome font to produce a unique gift. These fun sports ornaments arrive ready to display in our plush velvet drawstring pouch, so cheer on your favorite freestyler, backstroker or butterfly specialist with the male swimmer Christmas ornament personalized just for him. Male Swimmer Oct 10, 2017 Paula J.